As we know, bus drivers can sometimes be a problem. Now, don't get me wrong - I rarely have wrong words with bus drivers, mainly because I can't understand what they're shouting at me, and I recognise that it's only the badly-behaved majority that tar the rest with the same brush - but we rather like the novelty of having a friendly encounter with a bus. 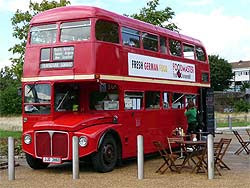 So here's your opportunity: Foodmaster, a double-decker bus converted into a mobile cafe. It serves top coffee and cakes, and hearty German sausages, and is currently doing a season in Mile End park every week (by the Art Pavilion at the end of Ashcroft Road) from Thursday to Sunday. There's lots of bike racks, and it's just off the canal, so you can get there pleasantly and traffic-free. It therefore joins the growing list of bike-friendly cafes in London, which are appearing faster than TfL press releases these days. So if you miss it, don't worry, there'll be another one along in a minute. And if it's sunny you can nip down to the Palm Tree pub just by the canal here which is also a bit of an East End bike mecca when the weather is fair. Many happy hours spent there getting quietly tiddled on the grass before pushing my bike home. 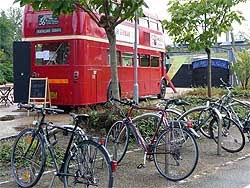 Thanks for the tip Rob; I hadn't spotted this bus cafe. Old Routemasters becoming eating establishments seems to be quite the thing these days; there's one in Brick Lane / Truman's Yard and another in Soho too. Rather there than trying to overtake me on the Holborn Circus roundabout any day!